When asked what one should read next, my advisor in graduate school advised me to read next what I’d be embarrassed to admit to someone, a colleague, that I haven’t read. Given the infinity of what there is to read, this remains pretty good advice, which I share with graduate students. 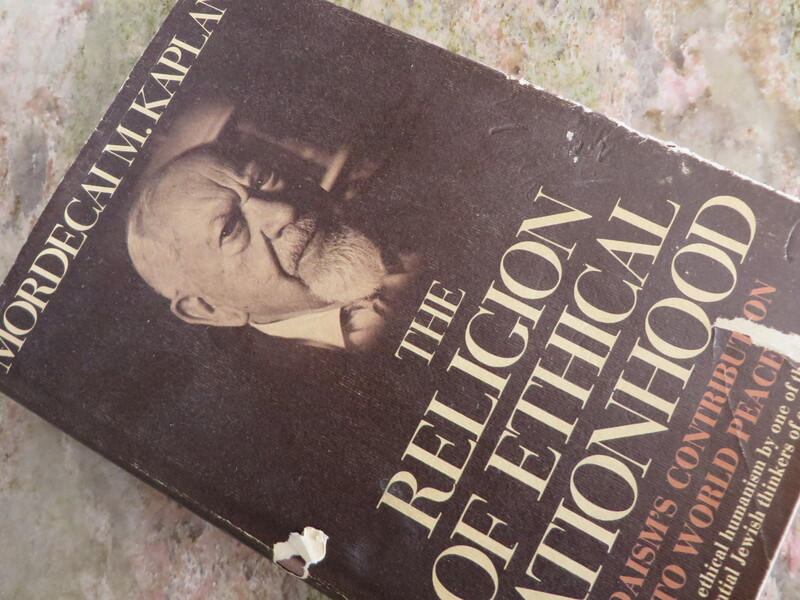 Mordecai Kaplan’s Religion of Ethical Nationhood never made that list. I was too busy working on other things about which I had to read other books. Having found myself now needing to have read, I finally got around to it, while reading it in conjunction with Mel Scult’s edited first volume of Kaplan’s journals and Mel’s own The Radical American Judaism of Mordecai M. Kaplan. The first thing that shocked me was the copyright date. I must have forgotten that this got published in 1970 when Kaplan was over 80. The first thing I want to say is that it’s probably the best thing he wrote after Judaism as Civilization. Years ago, in graduate school, I read The Meaning of God in Modern Jewish Religion, and found it very wanting. Part of the reason is that the new immanence in religion and had not yet made its impact, its first real appearance in either popular Jewish theology or academic Jewish philosophy. And while I still find the new immanence unsatisfactory for philosophical reasons too complex for here, I’m at least impressed now how Kaplan got the historical jump on it. But part of the reason is that my point of view was more narrow then, back in graduate school. While I have friends who go to it today for “ethical nationhood,” I’m finding other things here that are more interesting to me, those being things relating to art, science, and technology, entropy, and energy. I’m going to go through all this piecemeal, in bits and pieces, and will do so in tandem with the first volume of journals, as well as Mel’s book, which I’m reading now and which I’ll introduce later. What I’ll say later in relation to Mel’s book, Kaplan’s work is “American Religion,” and by this I will mean something general in relation to Kaplan’s American philosophical source material; and I will mean, maybe, something specific in relation to what Harold Bloom meant by “The American Religion,” namely gnostic self-perfection. I feel like I’m ready to make these connections in ways that would have made no sense to me several years ago in graduate school. The first thing I think I understand now is something I’ve never liked about Kaplan, which is the perpetual scowl on his face in almost every photograph I’ve ever seen of him, like he’s angry and wants to beat up someone. And how might that scowl have carried over into his thought? I think I now know the answer. Stay tuned. I’m going deep into Kaplandia. This entry was posted in uncategorized and tagged American Judaism, Mordecai Kaplan, what i'm reading. Bookmark the permalink.